Thought I’d share a digital painting done with Topaz, a program I’ve been experimenting with. They’ve recently added Topaz Impression to their collection which enables you to process a photograph as a painting. Of course, if you want to get the full effect you have to process the photo with Photoshop, adding texture layers, contrast, saturation, etc., before running it through Topaz. 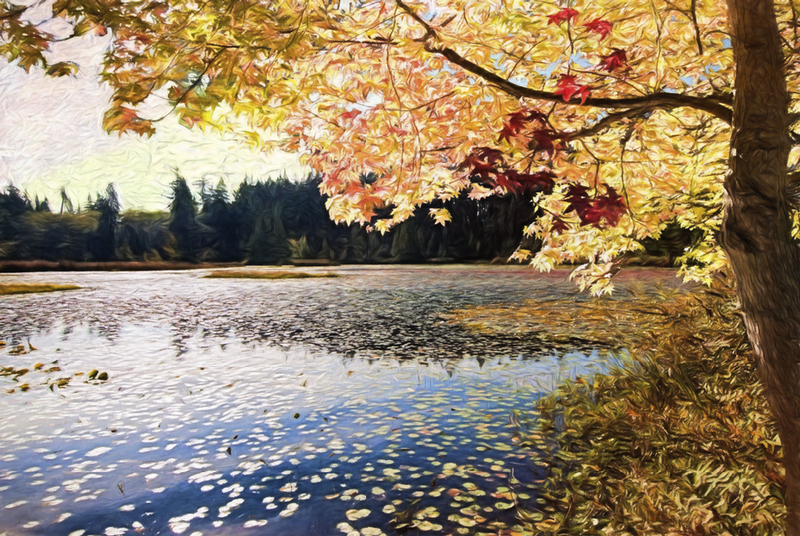 In this digital painting I combined two rather nondescript photos of a pond and a tree, then ran it through Topaz Impression. I ran it through about five times using different painting effects, each time placing the result as a layer over the processed image in Photoshop. I set the blending mode for each layer to selectively bring out only parts of it before adding the next layer from Topaz. This way I could keep what I liked about each layer as I developed the image. Not saying this is my best effort, but wanted to give you a look at what one can do with photos that would otherwise be discarded. You are currently reading Digital Landscape Painting 0127 at awilliamsii.